But first I had to traverse the moors: a vast wilderness whose atmospheric, wild charms evoke strong memories of when I was a sixth former, completely engrossed in the study of Emily Bronte's moors-based novel Wuthering Heights. All of this nostalgia is heightened by the mist and driving rain and the helter skelter route which heads up to the coast makes for quite a thrilling ride. Whitby itself is the ultimate tourist town. Suprisingly unspoilt and genteel, the town features regularly these days in seaside resort top 10's. That said, it's a town of contrasts, at once brash and beautiful - perched on a cliff, pretty stone cottages tumble down to the arcades and tourist shops which line the harbour. Historically, a great seafaring town, this is the home of Captain James Cook. 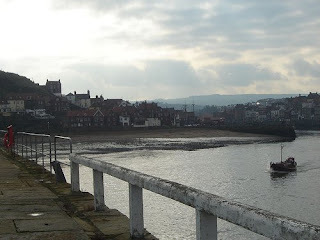 He served his apprenticeship in Whitby in 1746 and the great ship Endeavour was also built here. More than a thousand years earlier, the town was an important centre for Christianity when in 657, St Hilda founded Whitby Abbey. The abbey's dramatic, windswept ruins overlook the town from the top of cliff, and can only be reached by the 199 steps which start at Church Street. 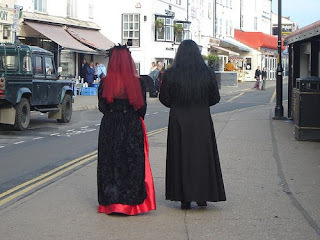 Today, Whitby is not only a historical tourist attraction, but a goth magnet (see below, two beautiful specimens seen pacing the high street), thanks to its other famous 'son' - the fictious vampire Count Dracula who arrived here on a ship full of dead men. 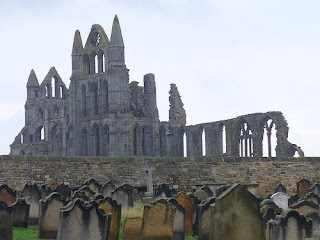 Bram Stoker, Dracula's creator, was apparently inspired by the town and its stark abbey ruins - he penned the novel while staying at the Royal Hotel in Whitby.